Carpet is undeniably one of the most popular flooring choices for many homeowners. The warmth and comfort that comes from having carpet installed in your home is unparalleled, but many homeowners may have questions when it comes to choosing the perfect carpet option for their home. From carpet care to choosing the perfect carpet, Flooring Canada strives to clear up your common carpet conundrums. Is carpet a suitable choice for homes that have inhabitants who suffer allergies or have chronic illnesses like asthma? At Flooring Canada, we carry many hypoallergenic carpet options that are perfectly suitable for homes that may have inhabitants who suffer from allergies or asthma. It is also recommended to vacuum your carpet often to help keep dust and other particles from collecting in the fibers. When looking for hypoallergenic carpet options, look for Green Label- certified carpet. With the variety of different options in today’s market, and the many different types of fibers, how do I know which one to choose? Every carpet and carpet fiber has its own characteristics. From extremely durable carpeting to extra soft carpet, it’s important to assess how much traffic your room gets before deciding on carpet or fiber type. For durable, heavy traffic, it’s recommended to choose a carpet with dense construction. Densely constructed carpets will not allow you to see the carpet backing when looking down at the carpet. To choose the right fiber, consider how you live in each room. To learn more about carpet fibers, visit our choosing carpet page. Do I need to put a carpet cushion under my carpet? It is recommended to use a carpet cushion with every carpet installation, as it can help prolong the life of the carpet as well as provide extra comfort underfoot. It’s important to check with the carpet manufacturer to ensure you’re choosing the correct cushion that meets cushion requirements. How often should I shampoo my new carpet? Regular care and maintenance can add exponential life to your carpet. It’s recommended to clean your carpet to manufacturer specifications at least once-twice per year. However, regular vacuuming, at least twice per week is highly encouraged. If you can’t find the time to vacuum your entire carpeted room twice per week, be sure to at least vacuum the heaviest traffic areas. Are there any benefits of carpet? 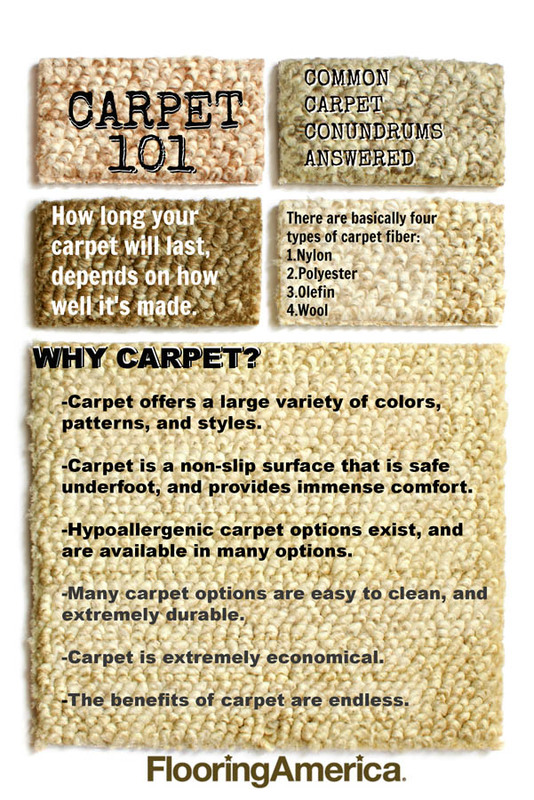 Carpet comes with a plethora of amazing benefits that you might not even realize! Carpeting can contribute to substantially retaining heat in a room, which results in lower energy consumption and a lower energy bill. Carpet also has a lot of noise reduction qualities and provides a safe and ample amount of cushioning which makes it a great choice for homes with fall risks, especially for the elderly and children.